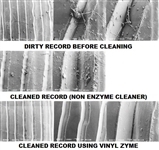 The TTVJAudio Vinyl Zyme Extra Strength is ideal for cleaning the records you pick up used or you brand new album to remove any residue. I use the Extra Strength on all of my albums the first time I clean them and then occasionally afterwards. This 8 oz bottle will clean many your records and they will sound much better without the pops and ticks! If you like it try our concentrate and mix yourself a gallon at a fraction of the price! let it sit for 30 seconds to 1 minute. Walla, your record is as good as it is ever going to be. And of course we highly recommend out TTVJ Inner Sleeves to put your newly cleaned record in. Don't want to give it a bath and put it back in a dirty sleeve do you? 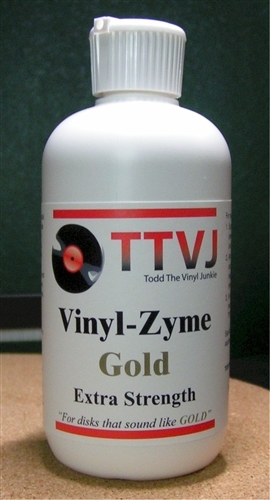 Since I bought Vinylzyme Gold from you, I have literally thrown away unopened bottles of other brand cleaners. Knowing that none of them would be able to match Vinylzyme. Yesterday I cleaned Best of The Monkees, and For Sale by the Beatles from 1964. 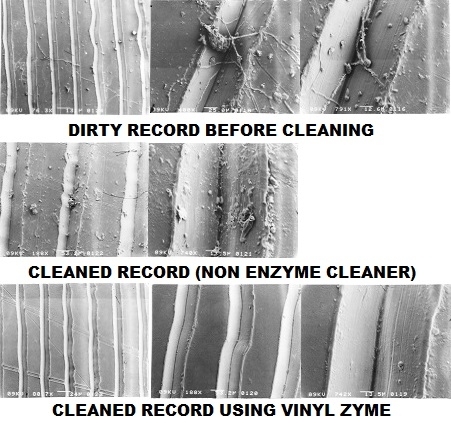 Both records were given a double cleaning on my RCM, brush in Vinylzyme let it soak for 6 minutes, vacuum off, new dose of Vinylzyme again a 6 minutes soak. All in all 24 minutes per LP. With The Beatles I expected some more than average clicks and pops, but when I dropped the needle in the run in groove it was totally silent!